If you’ve been following my blogs, you know that I love anything having to do with pumpkins. Pumpkin lattes (see my recipe here), pumpkin scones, pumpkin patches and my own lil pumpkins. So when my husband gave me a waffle maker – which in my family we joke about gifts like these being the gifts that keep on giving time and time again — I had to work on incorporating my favorite food into a waffle. There’s just something about the light flaky taste of a properly cooked waffle. Add a hint of pumpkin and bamn – pure bliss! Top it with spiced fruit or maple syrup and there’s no reason to leave the kitchen table other than to make another one. preheat your waffle iron. Then whisk together the eggs or egg replacer, brown sugar, oil until combined. A quick word about egg replacer for fellow folks with kids with egg allergies. I’ve tried different kinds and they seem to absorb moisture making batters more difficult to work with. So far, I’ve had the most success with the replacer made by Bob’s Red Mill which is available at Whole Foods or delivered to your door via Amazon. Add the pumpkin & vanilla. Mix until combined. Add the baking powder. Combine. Then whisk in the spices and flour. If too thick then add a little more water. If too thin, then add a little flour. 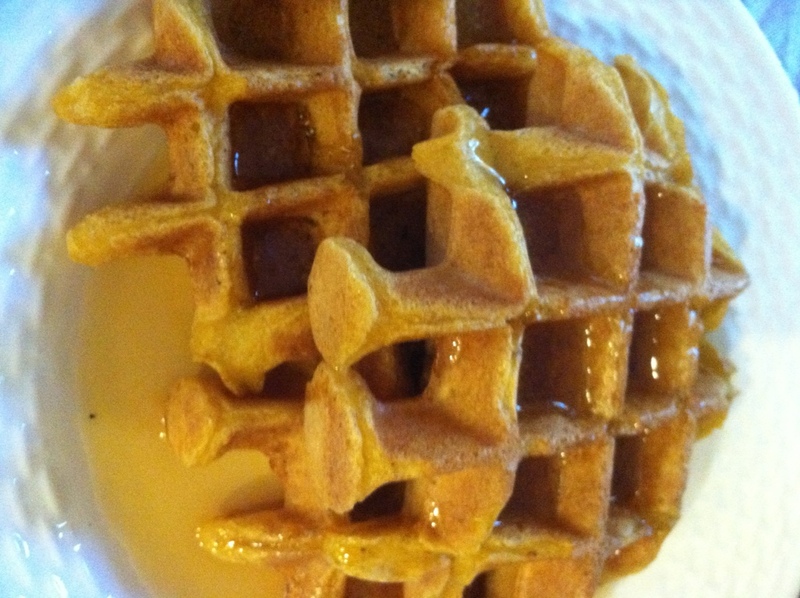 Coat your waffle iron with a non-stick spray or brush with melted butter. Cook to your liking and enjoy! I personally like my waffles a bit crispy and crunchy with an airy center. It’s the number 5 setting on the All Clad Waffle maker which truly has been the gift that keeps on giving. Serve right away as after awhile they will lose their crispy factor. Serve with butter (my other favorite ingredient), syrup and some spiced pears or applesauce if you have it. My neighbor just made some spiced applesauce that is so rich and flavorful. If you haven’t made your own for awhile, try it out. It is definitely worth the effort. Also serve with thick cut bacon; the perfect salty treat to compliment. In fact, I made these for my son’s 4th birthday. And, we had a friend who gave us some fresh thick cut bacon – it was a to die for combo! It’s just one of the many benefits of living out here in the sticks. So try it out, and let me know how it goes! Wishing you happy times baking up memories. pumpkin and waffles are such a double win!